Manny Pacquiao wants to know who you think he should fight next. Just don’t mention Errol Spence Jr. The unbeaten IBF welterweight champion isn’t one of the options. Pacquiao presented a poll through his Twitter account late Friday night, through which he asked about his next opponent. The options, in order, are Floyd Mayweather, Keith Thurman, Danny Garcia and Shawn Porter. In effect, it was Pacquiao’s not-so-subtle way of announcing he won’t oppose Spence next. Pacquiao attended Spence’s relatively easy victory over Mikey Garcia last Saturday night in Arlington, Texas, yet he seemed somewhat noncommittal regarding a potential fight against the strong southpaw from suburban Dallas during a post-fight interview. Understandably, Spence was much more open to facing Pacquiao next during the post-fight press conference last Saturday night. The 5-feet-10 Spence stands at least four inches taller than Pacquiao and would out-weigh the Filipino legend by about 15 pounds if they were to fight. A Spence-Pacquiao bout would draw another enormous crowd to the Dallas Cowboys’ AT&T Stadium, but the 29-year-old Spence (25-0, 21 KOs) would be heavily favored to defeat Pacquiao (61-7-2, 39 KOs). Thurman (29-0, 22 KOs, 1 NC), of Clearwater, Florida, is considered the frontrunner to land a pay-per-view fight against Pacquiao, probably in July. 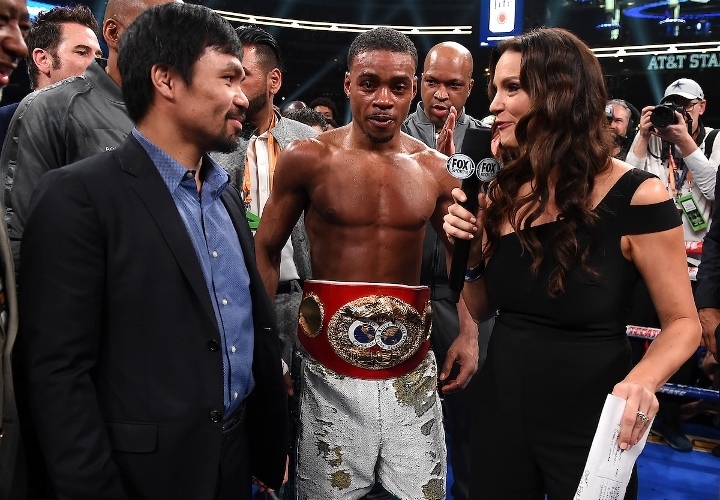 The 30-year-old Thurman, the WBA’s true welterweight champion, has been reluctant to face Spence and would earn a sizeable, seven-figure guarantee for facing Pacquiao, the WBA’s world welterweight title-holder. A rematch against with Las Vegas’ Porter (30-2-1, 17 KOs), the WBC 147-pound champion, also is an option for Thurman, who struggled at times during his 12-round, majority-decision defeat of Josesito Lopez on January 26 at Barclays Center in Brooklyn. Philadelphia’s Garcia (34-2, 20 KOs), whom Porter topped by unanimous decision six months ago to win the WBC title, is scheduled to meet Adrian Granados (20-6-2, 14 KOs, 1 NC) on April 20. FOX will televise Garcia-Granados that night from Dignity Sports Health Park in Carson, California. Mayweather, meanwhile, is expected to remain retired. While intrigued by the possibility of earning another nine-figure purse for facing Pacquiao again, the 42-year-old, wealthy superstar apparently has been discouraged by the physical and mental demands of training hard for their rematch. Pacquiao most recently beat Adrien Broner (33-4-1, 24 KOs, 1 NC) convincingly in their 12-round welterweight title bout January 19 at MGM Grand Garden Arena in Las Vegas. Whomever Pacquiao picks, Showtime or FOX is expected to distribute his next fight as a pay-per-view main event. Pacquiao only can fight late in June or in July because the Senate in the Philippines isn’t in session during that time. [QUOTE=abracada;19612263]Disappointed with Pac-Man. Why enter the damn ring and call out Spence, and 2 weeks later ignore it ever happened[/QUOTE] Did he call out Spence?